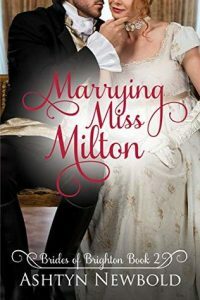 Marrying Miss Milton is a sweet & clean regency romance novel. I’ve really enjoyed reading Ashtyn Newbold’s books! I love that she’s writing these so quickly. It seems there is almost always a new one of hers to read and that makes me happy! I loved Jane in this one. I didn’t love the way her family treated her as almost an afterthought. All of Jane’s younger sisters have made advantageous matches. But Jane is as yet unmarried. She fancies herself in love with Viscount Barnet. I loved the way she and her friend, Caroline, figure out a way for Jane to follow Lord Barnet to Brighton, as a companion to Caroline’s grandmother. That’s where Jane meets Phillip. Phillip has just inherited the title of Marquess. I loved Jane and Phillip’s first meeting. Jane is besotted with Lord Barnet and wants nothing at all to do with Phillip. Jane’s mother has other ideas. Jane’s mother happens to catch the two in what she said was a compromising situation at a ball. And insisted the couple be married. Of course, Jane wants nothing to do with that. Phillip is not dismayed with the situation. I loved watching the two of them make things work in their forced marriage. They both grew and learned a lot. The situation ends up beautiful. This one has so many fun characters from A Convenient Engagement that I was thrilled to get to see again. I can’t wait to read the next book in this series! I was sent an e-copy of Marrying Miss Milton as a gift from the author. All opinions are my own.